Most of the kits that Jameco carries require through-hole soldering. This is when parts are soldered through metal holes on a circuit board. However there is a rise of kits being created that require SMD soldering, where surface mount components are being soldered directly on the board, creating a smaller compact footprint. Soldering is the practice of using solder, a filler, to join pieces of metal together at a fairly low temperature. The solder heats to a liquid and creates a bond between two metal materials to create an electrically conductive joint. Although soldering can seem a little intimidating the first time, rest assured after some practice you'll see how easy it is. Lower wattage soldering irons are perfect for soldering components onto circuit boards. There is a lower risk of damaging the components. However, you will notice that other components and materials – like wire – may need a higher wattage iron. We recommend using a temperature-controlled soldering station for quality results across the board. Solder comes in many thicknesses and multiple varieties of tin and lead construction. Most solder is made from a combination of 60% tin and 40% lead. However, due to changes in health codes mandating that lead solder be phased out, you'll see more lead-free alternatives available for use. Thin solder is used for detailed work, like placing components, and thicker solder is used for wire. Then there's some really thick stuff you'll see plumbers using on copper pipes. Solder that has a rosin core acts as a flux when soldering to help the connection. Silver-content solder requires more heat but flows more smoothly and creates a stronger joint. However, be warned that you'll have a higher risk of damaging the components. The tip is an attachment to the iron and the main tool in soldering. Tip width matters depending on the size of the solder pad you are working with. There are many different types of tips out there to use with different projects. The following types of tips are usually preferred because they offer more contact: conical, pointed, screwdriver and chisel. Not maintaining a clean and well tinned tip with a coat of solder at all times could lead to a soldering nightmare. Tinning your tip will improve conductivity and add longevity to your tip by reducing oxidation. Always keep a damp sponge or metal wool cleaner nearby to ensure you are always working with a clean tip. If you do use a damp sponge, wipe the tip quickly so as not to cool off the tip too much. Using a metal wool cleaner doesn't require water, so no heat will be lost. Make sure that you have sharp diagonal or flush cutters handy to trim all excess leads after soldering. Also, a third hand is always helpful. When placing your components on the board they should be pressed flush to the surface. It is also good practice to install the components in the same direction so that you'll be able to identify the components easily. The positioning of the tip and solder when getting ready to solder is very important in creating a perfect joint. The tip must come into contact with the lead and the board's pad. The iron will heat the pad and the lead. The heat of the two will then easily melt the solder creating a clean and solid joint. The solder that has been melted should create a small rising volcano around the lead. If the lead has not been heated with the pad, a rosin joint could result. 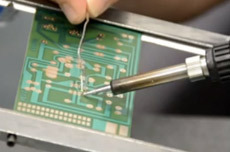 This is when the solder flows onto the pad but not the lead, the rosin forms around the lead, forming a rosin coating and not creating a connection. If this happens, simply reheat the joint. 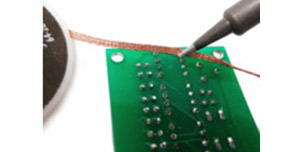 If you can still see the lead hole or any part of the pad, or if the solder is flat on the board, you may not have a proper connection. Simply add a little more solder and you should be fine. By putting too much solder on your board you may cause two pads to accidently connect together creating a connection that shouldn't be there, called a short circuit. You can fix this by simply using a desolder wick to remove the solder causing the connection. Sometimes running your iron right in the middle of the solder connection between the two pads will separate the connection easily. Check out Greg Harris' first attempts at soldering. Be sure to check out our customer-submitted soldering and safety tips before you start your next project.